In the bowl of a stand mixer, combine water, yeast, salt, egg, honey and melted butter. Pour in flour and mix until just combined using a dough hook (do not knead). Pour dough into a greased bowl, cover and let rest 2 hours or until doubled in bulk. Place covered, risen dough in refrigerator overnight or up to 5 days. Remove dough from the fridge and place on a lightly floured surface. Cut the dough into thirds using a pizza cutter or bench scraper. One at a time, place one third of the dough in the bowl of a stand mixer fixed with the paddle attachment. While mixing, add about 5 droplets of desired color. Mix until dough is saturated in desired color and remove from the stand mixer. Roll out colored dough into a long, thin rope about 1 inch thick. Repeat step 6 with other thirds of dough, making sure to clean out stand mixer and paddle each time you use it so colors don't blend. Once you have three long, thin colored ropes, start braiding them together from the middle. Use a tiny bit of water at the edges to keep them together if they aren't sticking. Cover braided loaf with a towel and let rest about 1 hour 40 minutes. Meanwhile, preheat oven to 350°F. When dough is risen, brush lightly with egg wash. Place on a baking stone and bake about 30 minutes or until top of the loaf is turning a golden brownish color. When I was little, my mom would dye my macaroni and cheese a blue or green hue, which I apparently thought was the coolest thing ever. I also really loved those yogurts with the sprinkles that turned all the colors of the rainbow when you swirled in the sugary pieces. And I couldn’t get enough of that green ketchup phase! But since my childhood, making or eating rainbow food wasn’t really part of my repertoire – until now. 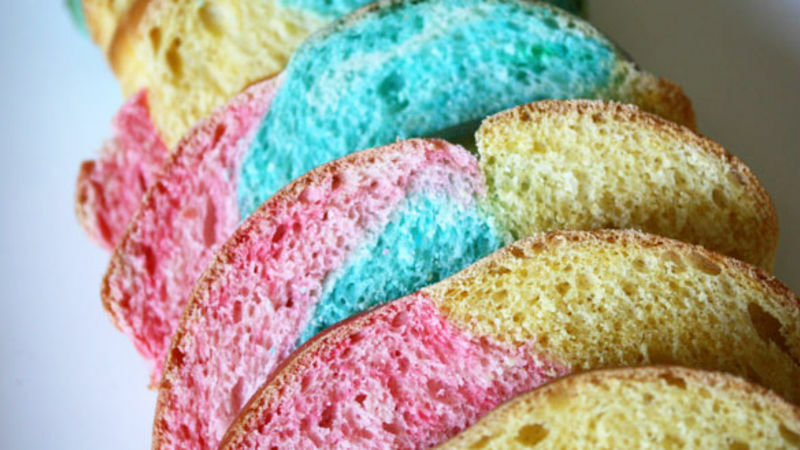 This Double Rainbow Bread is a fun recipe to make – not only is it fun to look at, but dyeing the individual pieces is a process where creativity is key. Though I stuck with the primary colors red, blue and yellow, you can mix and match your own braid colors. Need a game-day food? Dye the bread the colors of your team. Need a Thanksgiving loaf? Make a red, orange and gold bread. Also, if you don’t want to completely dye each braid piece, don’t overly mix in the food coloring and there will be a nice color “swirl” in each piece. The base of this recipe is a braided challah loaf, but you can use brioche or any other egg-based loaf for your own Double Rainbow Bread. It’s fluffy, slightly sweet and tasty all on its own. One word of caution: Unless you want an ugly brown-colored loaf (and I don’t mean bread’s natural golden brown color), be sure to thoroughly clean out your stand mixer bowl and paddle attachment (or whatever you use to incorporate the food coloring) in between colors. Otherwise, have fun with it! This recipe would be especially great for kids to help with – and it’ll get just as much attention at the dinner table.